Welcome to Cobbetts and Little Cobbetts, two luxury self-catering holiday cottages in North Cornwall and perfectly situated between the moors and the sea. Cobbetts, is a four bedroom property sleeping 8 and Little Cobbetts is a two bedroom property sleeping 4. 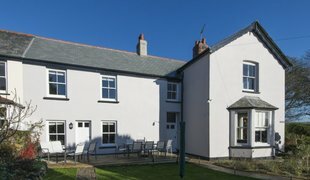 These unique holiday cottages provide all your home comforts and luxuries and give you the perfect base from which to explore all that Cornwall has to offer. And of course, well behaved dogs are most welcome! As you open the front door to step into Cobbetts you immediately feel relaxed. The high-quality decor and furnishings have been chosen to compliment the house perfectly and leave you with a feeling of serenity and calm. Enter the kitchen and the beautiful fragrance from the fresh flowers greets you and your guests, whilst the luxury hamper packed with goodies and essentials means that no one has to remember to bring the milk. Boasting this superb location in North Cornwall, Cobbetts and Little Cobbetts are perfect for those who want a truly memorable luxury self-catering holiday. 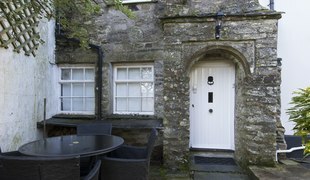 Situated in the tranquil countryside hamlet of Tregoodwell, the cottages are just a short 10 minute walk away from the historic 750 year old market town of Camelford where you will find shops, restaurants, country inns and all amenties. 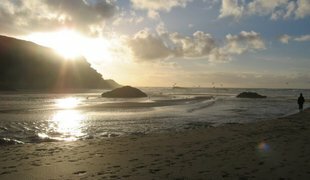 Fantastic sandy beaches, secret coves, spectacular cliff walks and stunning moorlands!